Put your name in front of prospective customers with eye-catching yard signs, complete with stakes and frames. 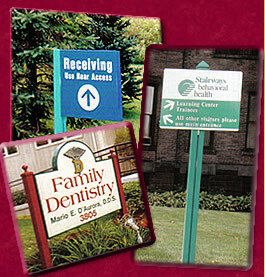 Small directional signs point the way to new residential and commercial developments. Curbside signs promote the attributes of rental properties or let you "sign your name" to a service well done and advertise your business. Large site signs provide the information prospective tenants or purchasers need.